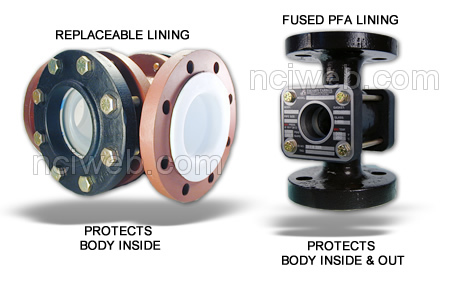 Lined Sight Flow Indicators are designed for viewing corrosive media. Except for the borosilicate glass, the lining of the indicator covers all otherwise wetted parts. The lining provides protection from attack by chemicals and solvents which can cause rapid deterioration of standard plastics and common metals. Lined bodies are available with special Teflon® drip tube or single-sheet flutter flapper indicators. Teflon resins are essentially chemically inert. The only known chemicals that react with Teflon are molten alkali metals, turbulent fluorine and a few fluoro-chemicals and halogenated organic chemicals. Teflon lined bodies are available with drip tube and flutter flapper style indicators. Tefzel® fluoropolymer resin is inert to strong mineral acids, inorganic bases, halogens and metal salt solutions. The material is ineffective with organic bases and very strong oxidizing acids near their boiling point. Tefzel has excellent mechanical strength, stiffness, and abrasion resistance and an effective temperature range from -370°F (-223°C) to 300°F (150°C). Pressure and temperature ratings will depend on the materials of construction and sight flow indicator model selected. * NOTE: ALL MODELS EMPLOY NON-STANDARD, SPECIAL, FACE TO FACE DIMENSIONS OF SUBSTRATE. SUBSTRATE: Carbon steel standard; stainless steel available for cryogenic service and corrosive atmospheres. APPLICATION: Blow molded to follow contours of substrate .